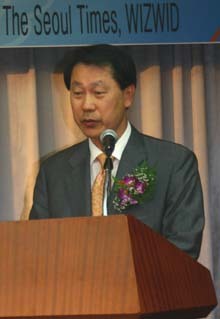 "2008 World Prestigious Brand Award" — Chairman Kim Wan-Hee of the World Luxury Brand Selection Committee poses for camera with other VIP guests and recipients of the award at the ceremony held at Cosmos Hall in the annex to the 63 City Tower in Yeoido-dong, Yeongdeungpo-gu on July 4, 2008. 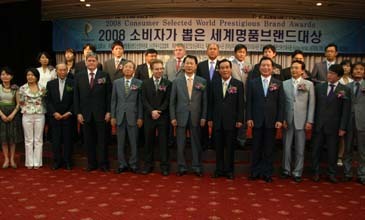 For the second year in a row world's best brands have been chosen for the year 2008 by selection committee members in Seoul with the high participation of numerous prestigious goods from local and international enterprises. A total of 18 luxury goods of the world were selected by the World Luxury Brand Selection Committee in an event "2008 World Prestigious Brand Awards" held at Cosmos Hall in the annex to the 63 City Tower in Yeoido-dong, Yeongdeungpo-gu on July 4, 2008. Each of the 18 world's luxury brands including local ones was announced in the awarding ceremony held at 2 p.m. on the day. Among them were LEXUS, ETRO, and a local cosmetic brand of HANSKIN. Other top brands included Christian Dior for perfume, IWC for watches, local brand of Xi for apartment, Hilton Namhae Golf & Spa for resort, and GIORGIO ARMANI for wear. In the category of "Special Product," Eumseong Clean Red Pepper was selected as the best brand among the agricultural products. (For details see the list below). The process was based on a survey of 1,000 consumers carefully chosen by the screening committee. The final selection was made by 66 experts drawn from various sectors of businesses. The contest was co-hosted by the World Luxury Brand Selection Committee chaired by Kim Wan-Hee and the Korea Importers' Association (KOIMA). It was sponsored by such famous organizations as the French Embassy in Seoul, the Italian Embassy in Seoul, and the European Union Chamber of Commerce in Korea (EUCCK). The local media The Seoul Times, online English-language newspaper, was the sole sponsor of the event. The committee explained that the items went through the primary screening by a survey of 1,000 individual users of luxury products. After the primary screening the products were analyzed by the committee members who evaluated their brand value, consumer's recognition, and the market situation, and so on. The evaluation process was based on the overall data analysis of each luxury item, and deliberation of each committe member composed of socially renowned figures or experts in the area. General manager, Ms. Oh Hyun-Ju of the committee's administration office said that Grand Prizes were awarded to the best products. The top luxury items represent each of the categories. She said that not only such values as the evaluation of the product, brand value, and management philosophy, but also other values like creativity and traditionality were the criteria for the selection. For details or inquires please contact Ms. Oh Hyun-Ju of the committee's admin. office at 2128-0754.